A blog is a website which enables individuals, groups, or organisations to easily publish content online. At the OERu we encourage learners to maintain a course blog to support their learning (e.g. sharing outputs of e-learning activities, reflective journal posts, connecting with your peers, etc.). In short, your course blog is an e-portfolio documenting your learning journey. You can use any blog platform which has the capabilities to tag or label posts and provides a “feed” URL (most popular blogs do do both). You can use one of the free hosted options on the web or host your own blog site. Popular options include Blogger, Medium, and WordPress. There are three steps to setting up your course blog for an OERu course. Note that you can use the same blog for all your courses, but you will need to register your blog url for each OERu course. Assign your blog URL Remember to assign the blog URL for the OERu courses you are enrolled for. Use the Blog Feed Finder site to assign your blog URL. 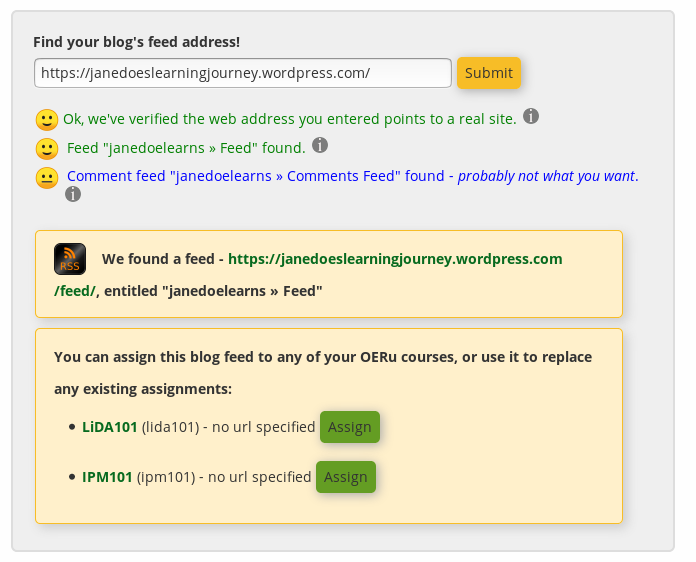 In this section we provide information on how the OERu technology platform uses the blog feed URL of your blog site to fetch posts for inclusion in the course feed. The OERu uses an automated process for fetching links to your blog posts for blog sites learners have assigned to the courses they are enrolled for. This process is automated, but it is useful to have a basic understanding of how this works. The courses a learner is enrolled for. The blog feed URLs the learner assigns to their enrolled courses. We have a blog feed finder website that simplifies this process (see below). Once a blog is assigned, the OERu software will periodically check the machine readable feed page. If it finds posts tagged with the course code, it will fetch and include a link to your post in the course feed on the course site. Assuming that you have assigned your blog URL and tagged your posts using the course code, the scanner will fetch links to these blog posts and automatically include a link to posts it finds that are tagged with the course code. Note that the feed scanner will check registered blog sites about three times each hour for appropriately tagged posts, so it may take a while for your post to appear in the course feed after registering or updating your blog URL. OERu courses all include a “Course feed“. The purpose of the feed is to generate a timeline of comments and posts from different sources on the web. You can make your own blog part of the network of places the OERu’s “feed scanner” check for posts of interest to learners for inclusion in the course feed. If you assign the URL of your blog to the courses you are enrolled for, links to your blog posts tagged with the course code will be included in the course feed. You will use the Blog Feed Finder site to assign your blog feed URL. Log in to your course site. Open the public view of your blog site in a new tab or window in your browser (the software you use to view websites). Copy the web address (or URL) of your blog site including the http:// or https:// prefix from your browser’s web address text field near the top of the window. Omitting the http:// or https:// prefix of your url. Using the URL for the “editing view,” where you update the content on your blog rather than viewing the result. You must submit the URL for the published, public view of your blog. Check for typos in the URL you submitted. Confirm that you have an Internet connection. In rare cases, your blog site may be temporarily down. The feed finder will provide succinct feedback if the URL is a valid address and a succinct summary of the URLs of the feed pages it finds on your blog site. 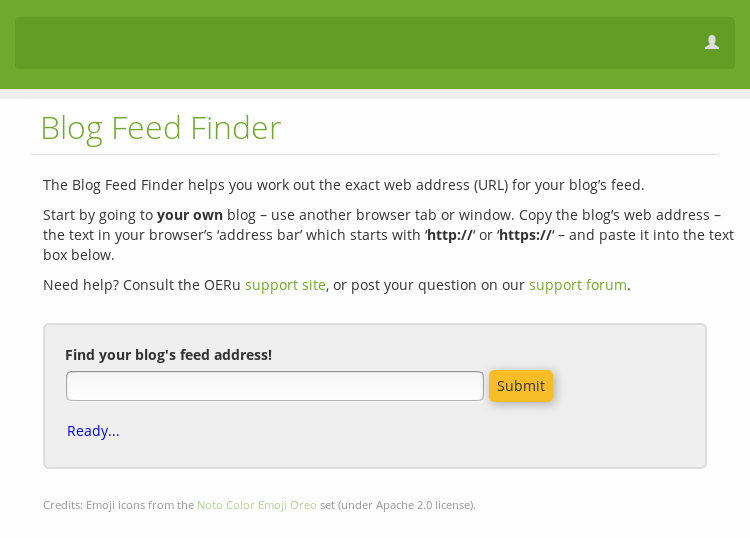 The blog feed finder provides you with the option to select the feed type. Some sites also provide a feed URL for “Comments” – Don’t select a comment feed if displayed – note that the Blog Feed Finder may not warn you if the blog’s language is something other than English. After selecting a feed, the site will list all the OERu courses you are currently enrolled for. You can assign your blog feed URL to any or all the courses you are enrolled for. Most learners use the same blog for all their courses, tagging individual posts with the relevant unique course code (or codes, if a post is relevant to multiple courses). You are, however, welcome to assign a different blog to any of your courses if you like. (See replace blog feed below). You can change or replace a previously assigned blog feed with another blog feed URL for any course. This only applies if you have previously assigned a blog feed URL. 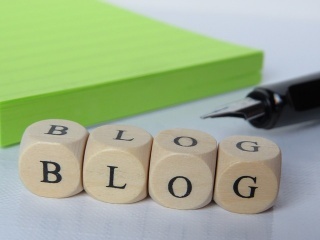 Go to the Blog Feed Finder site and enter the blog URL for your new blog assignment. Click “Submit”.